Excellent overview of the Rhodesian Light Infantry, the rapid reaction force of Rhodesia during its long fight against Marxist guerrillas. The RLI never enjoyed the technological advantages that the U.S. Army of the time could claim, nor was it lavishly funded and equipped as some European regiments were. However, the RLI managed to consistently find and defeat the "terrs" by using the most suitable equipment available and tactical innovations, such as the Fireforce concept. 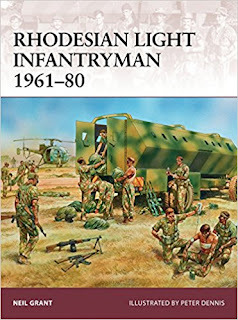 Splendidly illustrated with photos and original artwork, Grant's book touches on virtually all aspects of life in the Rhodesian Light Infantry, including weaponry, uniforms and clothing, manning (volunteers at first, then conscripts), billeting, pay, etc. Like most Osprey books, this volume serves as an excellent book in its own right or a reference when reading about the history of this forgotten conflict.